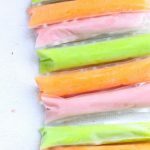 Need a quick and easy summer craft idea? 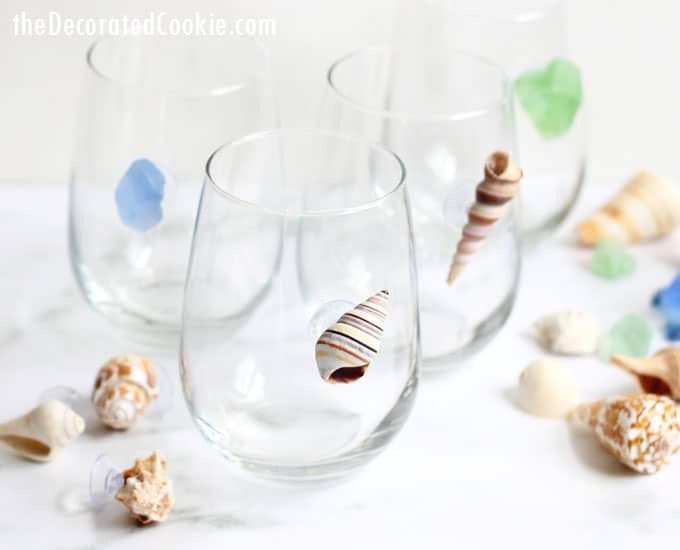 Make these gorgeous sea shell wine charms for your next beach-themed party. 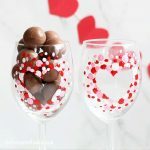 Dress up your guests’ wine glasses for the summer! 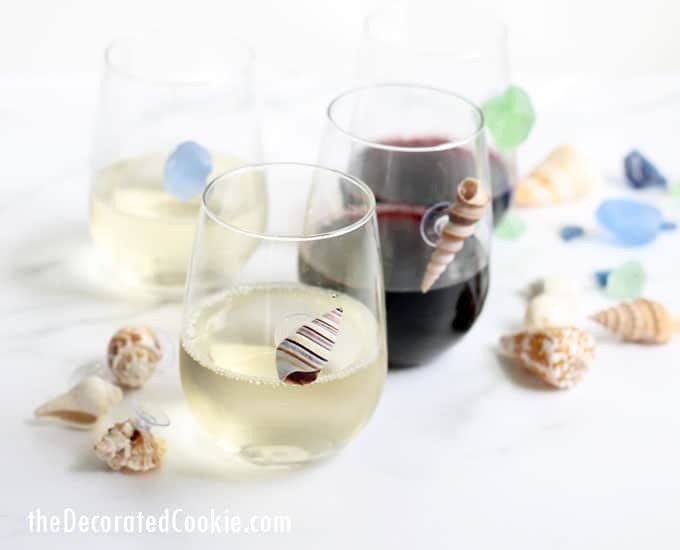 Sea shell wine charms take minutes to make, but they are sure to be a conversation starter at your beach party or backyard barbecue. Use sea shells (or even sea glass) you find while beach combing, or purchase sea shells online or from the craft store. If you like this idea, you can make wine charms from any trinkets for any season. 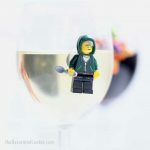 I even used this method to make Lego Minifigures wine charms. *Any strong, viscous glue will work. I find that glue from a hot glue gun doesn’t stick well to the suction cups, so I don’t advise hot glue. 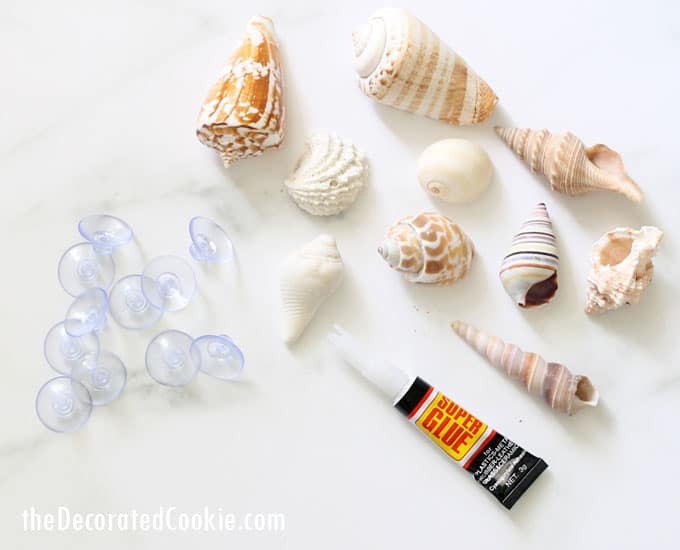 For the sea shells, choose small shells (about 1-inch across) that will work for this project, that is, shells with rounded backs so you the suction cup will fit. Clam and scallop shells, for example, will likely be too hollow in the back for the suction cup to reach the glass. 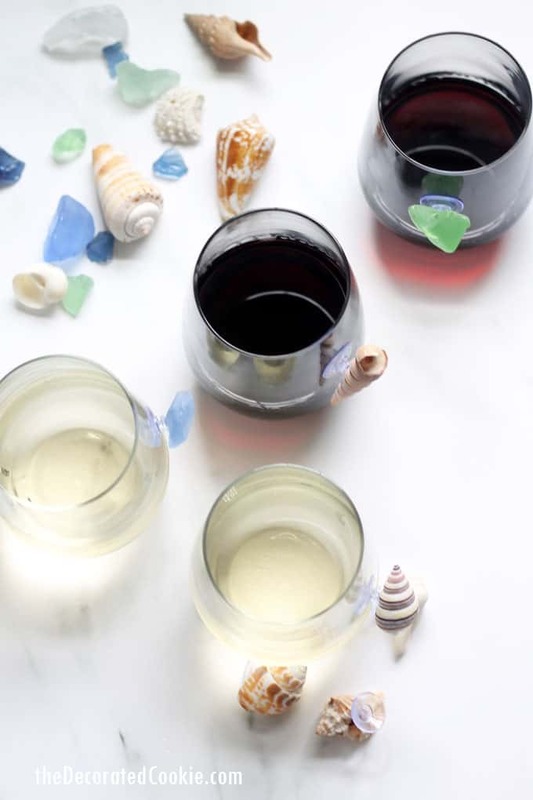 To make sea shell wine charms, simply glue the suction cup (non-suction side) to the back of a shell. For best results, place the suction cup on your protected work surface, suction cup down. I find freezer paper works well here to cover your work surface. Add glue to the top of the suction cup and rest the shell on top, holding the shell lightly until the glue sets. Let the glue dry completely before using your wine charms. You can personalize your wine charms for summer any way you like. 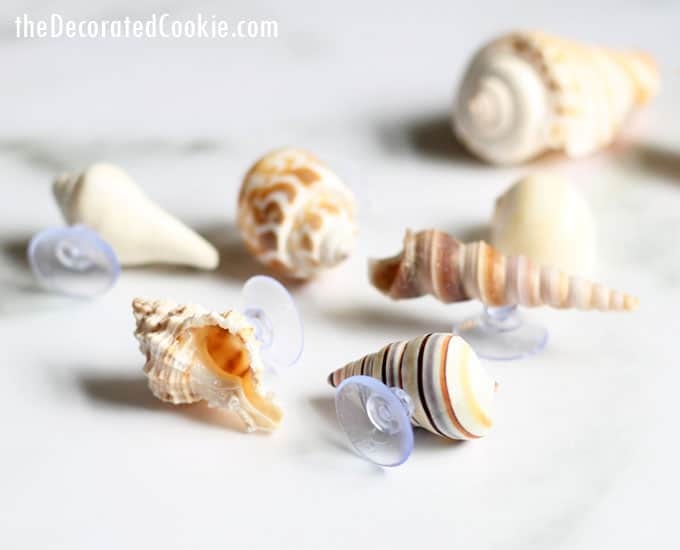 In addition to sea shells, try sea glass or even little summer-themed toys such as light-weight party favors. I’m pretty sure I’ll never purchase store-bought wine charms again! Looking for more summer party ideas? 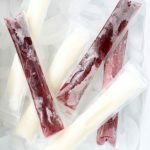 Serve boozy cocktail slushies as freezer pops for easy, refreshing drinks to enjoy at the beach and pool or in the backyard. 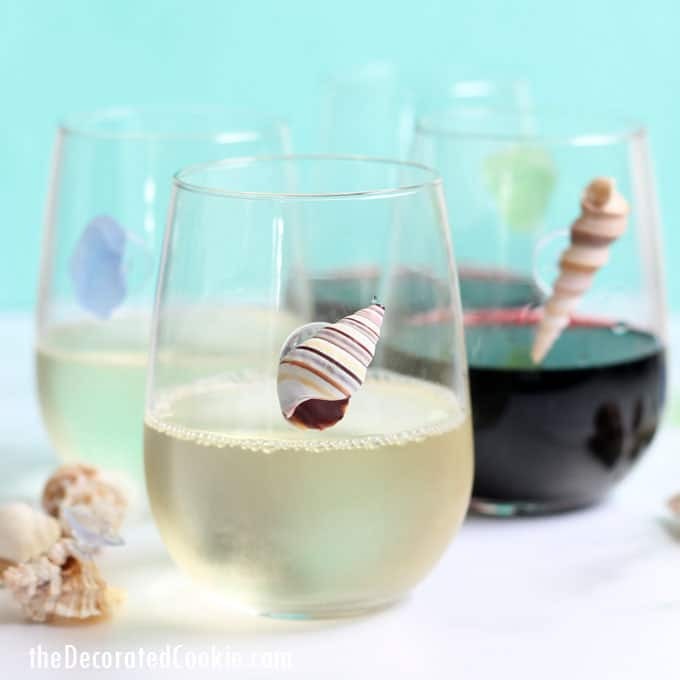 This post for seashell wine charms also appears on Crafts by Amanda. 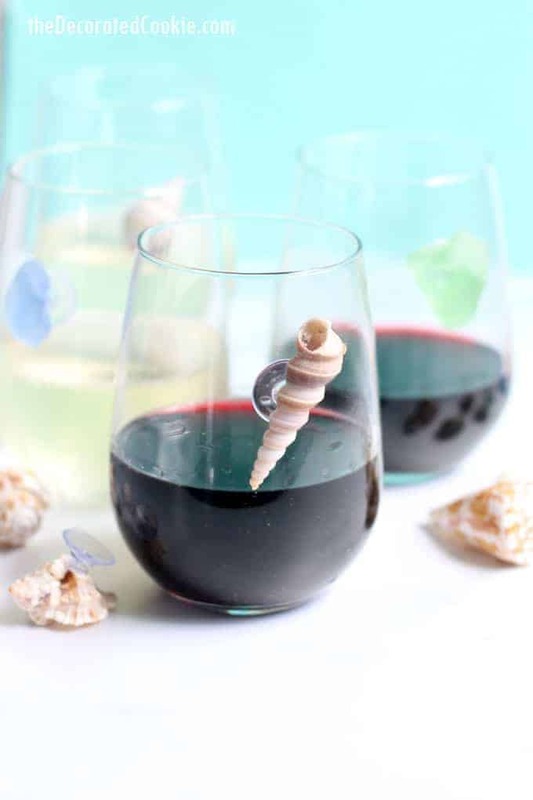 To make sea shell wine charms, simply glue the suction cup (non-suction side) to the back of a shell. For best results, place the suction cup on your protected work surface, suction cup down. I find freezer paper works well here to cover your work surface. Add glue to the top of the suction cup and rest the shell on top, holding the shell lightly until the glue sets. Let the glue dry completely before using your wine charms.